As co-owner and director of a fine-art gallery, I am surrounded by the work of immensely talented people, painters and sculptors, who share my sense of life and fill our gallery with the stylized recreations of reality that bring joy and inspiration to so many. While a painting of a beautiful scene or portrait can take my breath away—I thoroughly enjoy gazing upon the beauty of an original painting by William Bougereau or Maxfield Parish—sculpture has always fascinated me, as it beckons to be viewed, touched, and enjoyed from many angles. Among the sculpture types, figurative works are my personal favorite: properly executed, details such as the nape of a neck, the soft, round curves of a torso, the definition of muscles, the sense of movement can tell an enticing, alluring, captivating story. 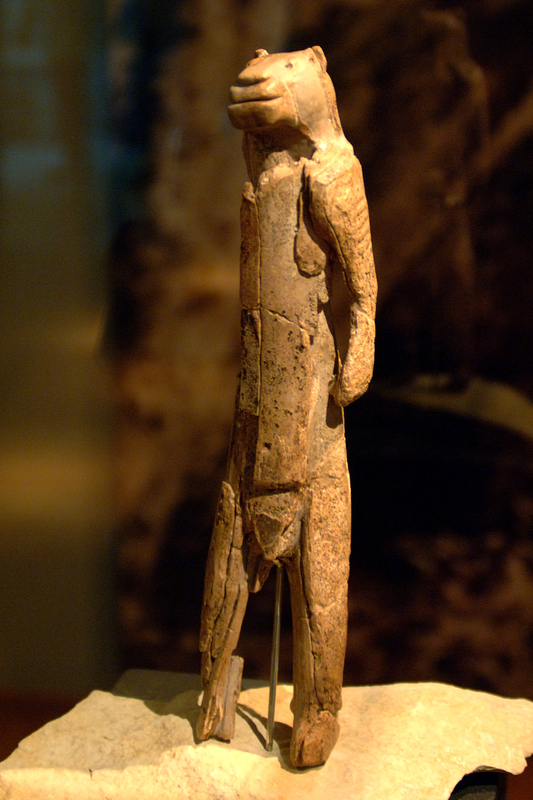 The earliest figurative sculpture yet discovered is an ivory carving of a lion-headed figure, known as the Lion Man of the Hohlenstein Stadel. Recognized as the oldest known anthropomorphic carving in the world, the piece was found in a cave in Hohlenstein Mountain, in the Swabian Jura of southwest Germany in the 1860s. Carbon-dating tests on the soil where the sculpture was discovered date the work to approximately 38,000 BCE, making it the earliest art of its type (male figure) in Europe. Down through history, the evolution of three-dimensional art has endured numerous changes in materials and subject matter. Carving of materials such as ivory, stone, and marble has largely given way to molding and casting figures in materials such as bronze, iron and acrylic, which allows multiple reproductions of a work. The oldest known examples of cast-metal objects were discovered in the Cave of the Treasure (Nahal Mishmar) hoard in southern Israel. Conservative carbon-14 dating estimates the items to c.3700 BCE, making them more than 5700 years old. Generally speaking, wherever metallurgical technology has been developed, metal has been used in sculpture. 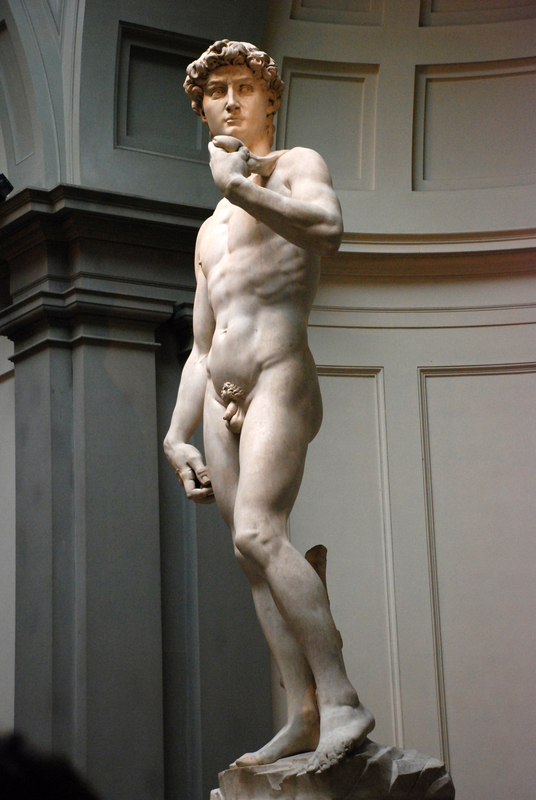 Over the past two millennia, the most common type of metal employed in figurative casting has been bronze, first perfected in the Greek art of the Classical period. Among the more famous figurative sculptures in bronze are the David by Donatello, created in the 15th century, and The Thinker by Rodin, created in 1902. Although much less popular with sculptors today, marble sculptures are among my personal favorites. These unique, one-off pieces are much more fragile than works cast in bronze. Some of the classical figures sculpted by artists such as Michelangelo and Bernini, from the 16th and 17th centuries respectively, have survived the test of time; many, however, were destroyed or have deteriorated over the centuries. Thankfully, given bronze’s durability, many other fine classical figures, from hundreds to thousands of years old, are still with us today. One of the most popular techniques of casting, the lost-wax method, has also been around for millennia. This process remains the best method for reproducing in hard metal a level of exquisite detail not otherwise possible, given the complexity and subtlety of design and form. The lost-wax process allows anything modeled in wax or clay to be recreated fully and faithfully into various metals. 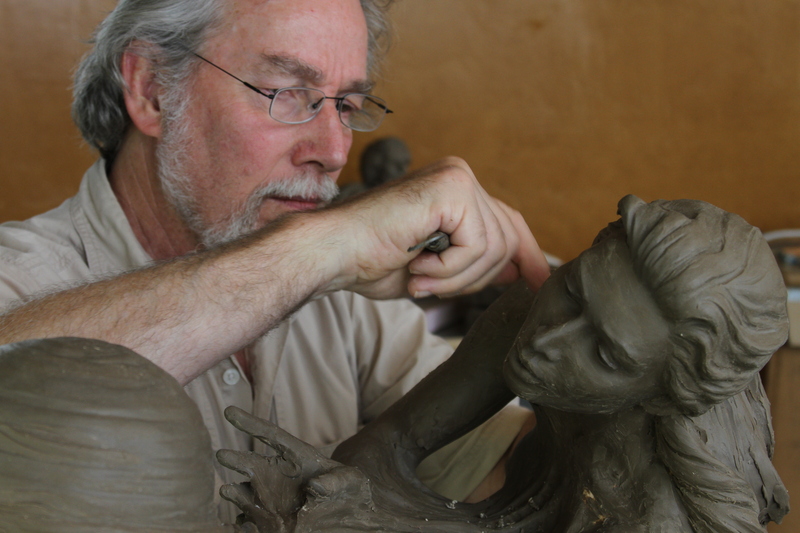 Most contemporary sculptors use water — or oil-based clay to create the model, in which care is taken to capture and model the smallest details; all details and features the artist desires in the finished piece must appear in the clay. The clay model is then encased in liquid rubber, and once the rubber is set, it is carefully cut away to provide a negative mold. 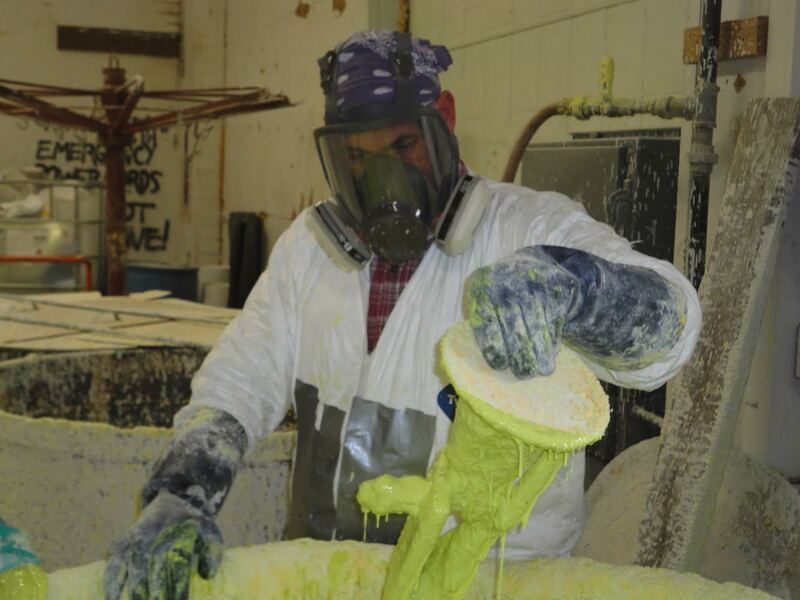 Molten wax is injected into the rubber cavity and allowed to cool. The wax, when removed from the rubber mold, is in the form of the original clay. After careful inspection and refinement, the new wax model is covered with a ceramic slurry, which is then fired in a kiln. Creating the ceramic mold. Photo courtesy of Artworks Foundry. The heat melts the wax, which trickles out through a tiny opening and is thus “lost.” All that remains is the ceramic mold, a perfect hollow in which every surface detail of the wax model has been captured. Molten bronze reaching temperatures of over 2300 degrees is poured into the ceramic. In the United States, the bronze alloy is comprised mostly of copper, with a small percentage of tin and additives such as silicon for workability and resistance to corrosion. Pouring the molten bronze. Photo courtesy of Artworks Foundry. Once the bronze has sufficiently cooled, the ceramic mold is broken apart, revealing the bronze casting. The bronze figure is cleaned and checked to ensure that every detail of the original has been faithfully reproduced. In some cases, the clay model has been divided into several pieces prior to the mold-making process—the consequent cast pieces are welded together prior to the sculpture being hallmarked and polished. 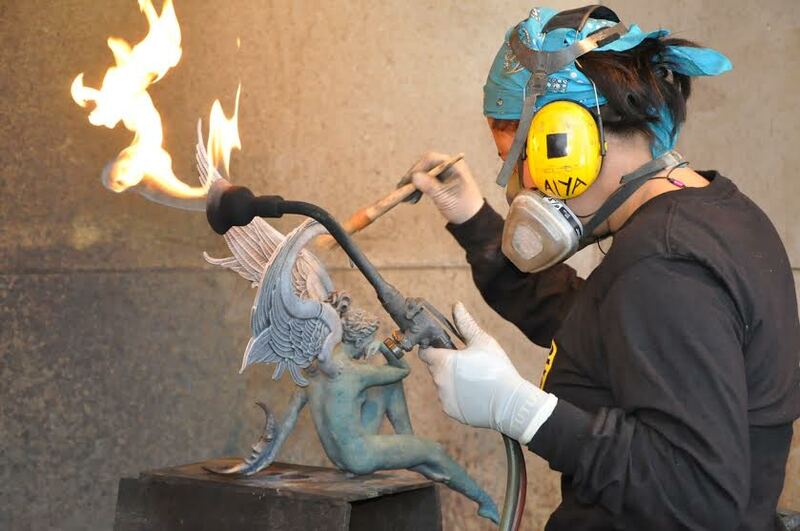 Many sculptures are limited to a specific number of castings (a “limited edition”). The casting number and the edition quantity are permanently stamped near the artist’s signature. Lastly, a patina is applied to the figure. On metal castings, the patina is usually a coating of various chemical compounds such as oxides, carbonates, sulfides, or sulfates, to change the appearance of the surface, the application of the chemicals with heat creating variations in color and finish. The result can be an appearance that is anything from a creamy, polished surface, more like marble than bronze, to a finish that resembles more the verdigris of a sculpture that has aged gracefully over time outdoors. Subtle washes of color, though not immediately apparent, can add depth and visual interest; for example, a pearlescent finish can lend a luminous sheen to the figure’s skin. Applying the patina. Photo courtesy of Artworks Foundry. Beginning life as nothing more than a lump of clay and an idea, the finished, realized figures embody an expression of the artist’s values, or concretizations of heroes or models, celebrations of life as it could and should be. 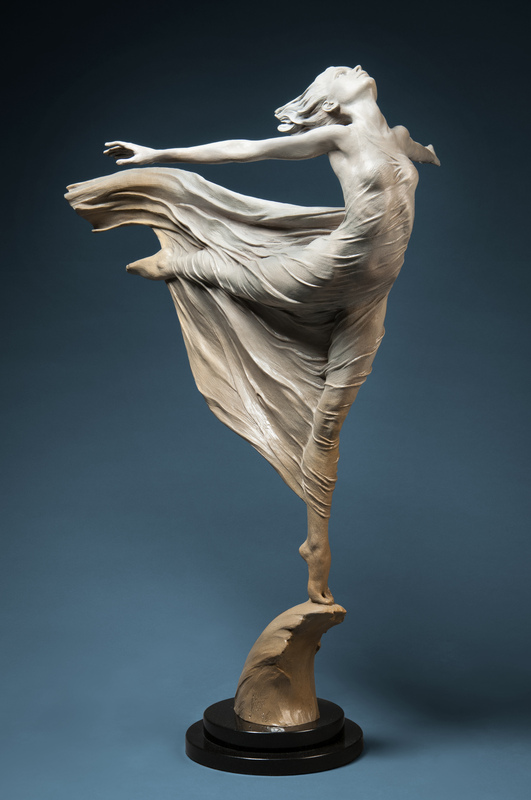 The work of Martin Eichinger, one of the sculptors represented by our gallery, combines the elegance and simplicity of sculpture that is inspired by the classical tradition with a sense of movement and emotion. His sculptures are narrative, pleasing the viewer with a style and grace that have won numerous awards and accolades, with romantic figures that gesture softly, begging the viewer to linger a little longer and be part of the story, and mythic figures that embody the struggle of humanity against what we imagine to be the most difficult for us to overcome. 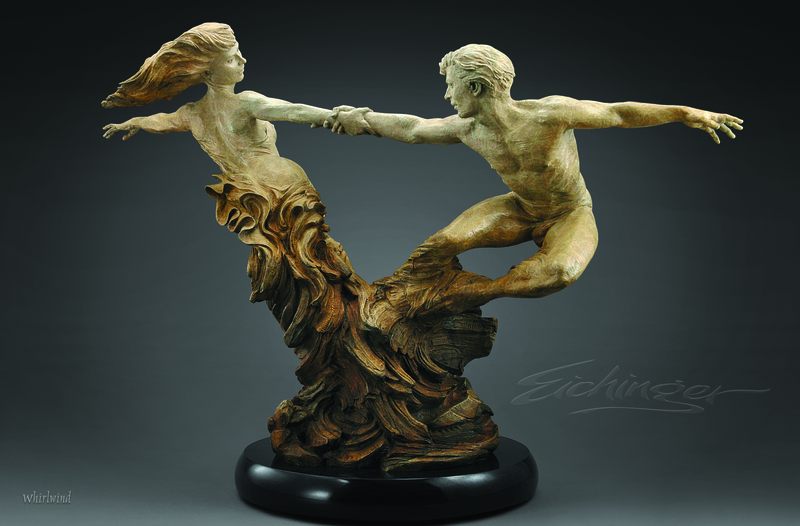 Although he’s often labeled as a figurative sculptor, Eichinger prefers being thought of as a narrative artist. 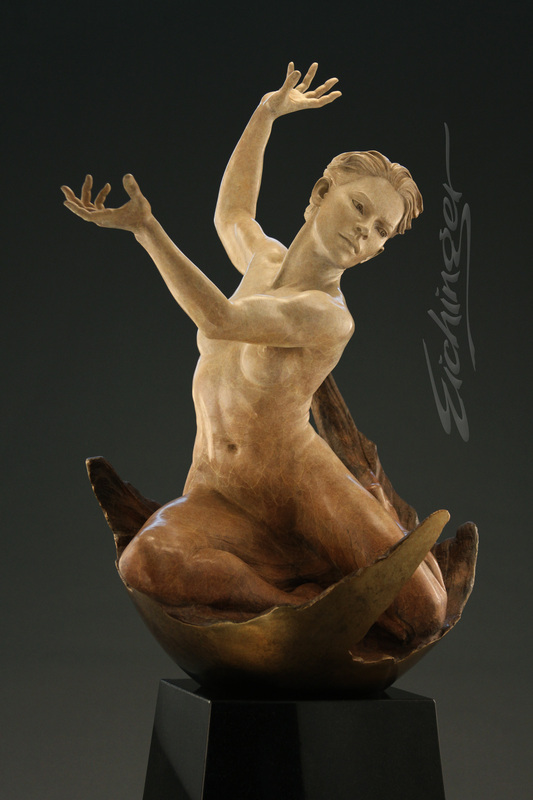 Eichinger became an artist “to participate in a renaissance dialog about our lives, our civilization and the essential elements that give meaning to life, aspiring to celebrate the best of mankind, the hope for tomorrow, the love of today.” His work, along with that of many other talented and inspired sculptors, is represented by Quent Cordair Fine Art in Napa, California, with a presence on-line at www.cordair.com. I hope you’ve enjoyed this brief history of metal sculpture and the overview of the lost-wax process. Falling in love with a work of art is a beautiful and unforgettable experience. I fall in love with the sculptures I work with every day. Living with art in one’s own space is remarkably sublime. And someone figured that out 37,000 years ago, even while living in a cave.